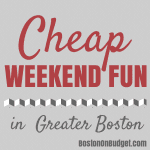 Cheap Weekend Fun in Boston for July 12-13, 2014! 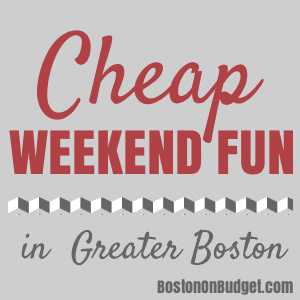 There are so many fun and cheap things to do in Boston this weekend! If you also have Friday off this summer, make sure to check out all the Free Friday Events in Boston! Boston Landmarks Orchestra: Sunday, July 13, 2014 starting at 5pm in Jamaica Plain. Free family concert with Landmarks Brass and the brass ensemble of the Conservatory Lab Charter School. WGBH FunFest: Saturday, July 12, 2014 at WGBH Studios in Brighton. Enjoy live music, ice cream, and more for this summertime family fun event. Tickets are $10, but discount tickets are available for $5 between 2-4pm (affiliate link). Futures at Fenway and Field of Dreams Movie Screening: Sunday, July 13, 2014 at Fenway Park. Cheer on the Lowell Spinners at Fenway Park and bring your dog too (must call for designated seating). After the game, stick around for a movie showing of Field of Dreams at Fenway Park. Tickets are $15 (+ service fees). Yoga on the Square: Saturday, July 12, 2014 on the Copley Square lawn from 9-10:15am. Enjoy a free outdoor yoga class on Saturday morning sponsored by OMBE. Magic Family Film Festival: Saturday, July 12, 2014 at the Prudential Center courtyard at dusk. Enjoy a free outdoor movie screening every Saturday night at dusk. This week’s free outdoor movie is Monsters University! Free Movie Nights at Christopher Columbus Park: Sunday, July 12, 2014 at Christopher Columbus Park at dusk. Enjoy a free outdoor movie at Christopher Columbus Park in the north end at dusk. This week’s free outdoor movie is Field of Dreams! Also, don’t forget to check out Free Fitness Classes & Events in Boston as many free opportunities are available on the weekend as well as 27 Free Things to Do in Boston this Summer!